“I fully support the standup of a Space Force underneath the Air Force,” Raymond said in front of the House Armed Services Committee’s strategic forces subcommittee. WASHINGTON — In his first appearance on Capitol Hill since being nominated to run U.S. Space Command, Air Force Gen. John “Jay” Raymond, commander of Air Force Space Command, gave a full-throated endorsement to the Trump administration’s proposal to create a Space Force. 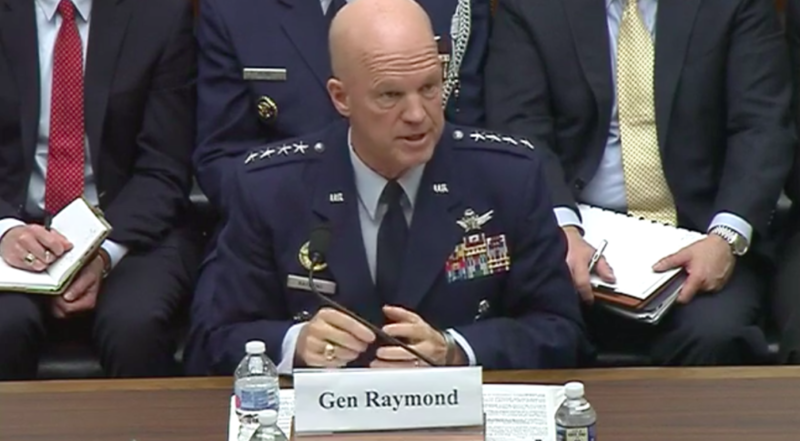 “I fully support the standup of a Space Force underneath the Air Force,” Raymond said on Wednesday in testimony to the House Armed Services Committee’s strategic forces subcommittee. Raymond testified alongside Kenneth Rapuano, assistant secretary of defense for homeland defense and global security, and Cristina Chaplain, director of contracting and national security acquisitions at the Government Accountability Office. Raymond said a separate military service will give space the importance it deserves. A major benefit of a Space Force, he said, is that will “align and unify space activities” that are now spread out across many organizations. A Space Force will be led by a four-star general who “will come to work every day focused on that domain,” Raymond said. The Defense Department in February submitted a legislative proposal that would create a Space Force under the Department of the Air Force, led by a four-star chief of staff, a four-star vice chief of staff and a civilian undersecretary. The plan has met widespread skepticism on Capitol Hill but not from the strategic forces subcommittee, which for years has been advocating for a separate space branch and remains Congress’ staunchest Space Force supporter. HASC Chairman Adam Smith (D-Wash.) specifically opposes giving DoD special authorities it seeks in the proposal to transfer people, funds, and to hire and fire civilian employees. The issue has become especially contentious after the White House directed DoD to transfer funds from other accounts to pay for a U.S.-Mexico border wall and Congress was not consulted. Rep. John Garamendi (D-Calif.) told Rapuano to not expect the committee to approve any special authorities to transfer funds. Smith blasted DoD’s Space Force proposal for requesting an “almost unlimited” seven-year personnel and funding transfer authority that seeks to waive a wide range of existing laws — all without a detailed plan or analysis of the potential end state or cost. And he criticized the proposal as an “attack on the rights of DoD civilian employees” that seeks broad authority to waive long-standing civil service rules, pay rates, merit-based hiring and senior civilian management practices. Aside from those issues, said Rogers, he expects the committee to support the establishment of a Space Force. He gave Chaplain credit for doing the analytical work that persuaded the committee to write legislation two years ago to create a Space Corps. Chaplain said she supports the Space Force as a separate service. She has over the years been consistently critical of the Air Force’s management of space programs which makes it difficult for GAO and others to track space programs, spending and personnel.